Usually men neglect their skincare routines although they have to work in the field which could cause dead skin cells when regenerating process of our skin slows down with age. Your skin also needs a deeper cleanser with scrub to remove dead skin cells to improve skin condition and fresh complexion. Sebum (natural oil) production on the skin causes clogged open pores with dirt particles and dust. Which leads to pimples, dullness, flaky and rough skin layer on face. Natural exfoliate or scrub can be more effective without any side effect rather than using market products. Mix 1 tablespoon Yeast powder, 1 ½ teaspoon Yogurt, 1 teaspoon Lemon Juice, 1 teaspoon Carrot juice and 1 teaspoon Almond oil. Mix all the ingredients very well and apply it on your face for 20 minutes. Then wash with normal water. If you have dry or flaky skin use this scrub prior to shaving. Almond oil in this scrub will reveal a fresh complexion which work as a good moisturizer for flaky and dry skin. Mix dry milk powder 1 tablespoon, 1 tablespoon Barley powder and 2 tablespoon lemon juice and make a fine paste. Apply it on your face and leave it to dry when it become dry scratch it and wash your face with normal water. Take 1 Egg Yolk and mix 2 teaspoons Almond oil in it. Then add 2 tablespoons dry Milk powder and 1 teaspoon Yogurt. Apply it on your face and leave it for 8-10 minutes then simply rinse off to reveal a smoother complexion. Take 2 tablespoons ground Oatmeal, 1 teaspoon Lemon juice, 1 teaspoon Honey and 1 teaspoon Carrot or radish juice. Mix it and make a smooth fine paste. Apply it on your face and leave it to dry when becomes dry wet it again with lukewarm water and smoothly massage with your finger tips. Then wash your face with lukewarm water. 1)Wash and clean your face before applying any scrub. 2)100 grams Spinach with a little amount of water and add 1 pinch of salt in it. Filter the water then mix 1 teaspoon honey in it and drink it. Drinking daily this water for 1 or 2 months best to get fair complexion of the whole body. 3)Avoid overuse of scrub it may remove natural oils which maintain skin elasticity. 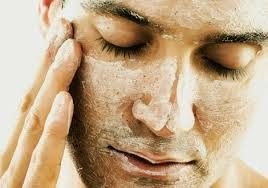 4)Use a face scrub no more than two or three times a week. This may cause excessive dryness. 5)Oily skin needs to clean or remove grease and excess sebum production twice in a day. 6)Daily take 1 glass of warm milk before going to sleep which works as a skin cleanser for the whole body. 7)Drinking 1 glass fruit juice before going out can protect your skin from damaging.